You know that networking is important. But if you are like me, you find networking events hard work. You’re not really sure what to say or how to get a good conversation going. Part of the problem is that we put too much pressure on ourselves to do all the talking in social situations. Well, about 10 years ago I learned a valuable lesson: you can be a good conversationalist simply by asking questions. Here’s what happened. I was all set to attend a Human Resources Institute of New Zealand conference when a friend, Mary Alice Arthur, told me I simply had to meet a man called Christian Dahmen. Mary Alice then arranged for me to sit next to Christian at the conference dinner. Now, I wasn’t really in the mood for talking on the night of the dinner, so I set myself the challenge to say as little as possible and instead help Christian and the people around us do all the talking. If you had known Christian, who sadly passed away a few years ago, you would know that it wasn’t hard to encourage him to share his thoughts. Still, throughout the night, I asked questions that I hoped would prompt him to share more stories with me. And they did. The really surprising thing happened at the very end of the night. As we stood up to head home, Christian shook my hand and said, ‘It was a pleasure meeting you Shawn. You are a wonderful conversationalist’. In the wake of that night, we became close friends. 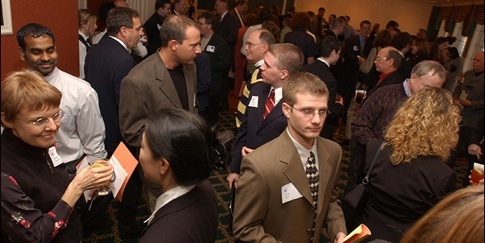 Remembering this experience got me thinking about what are some good story-eliciting questions to ask when you are at a business dinner, a cocktail party, a professional society awards night or a networking event for business folk. I came up with the following 10 questions which you can use to encourage the telling of stories. When this happens, you’ll remember your own stories, as will other people. The act of sharing them will make these stories resonate, and you will all draw just that little bit closer. Have there been any big turning points for you in the last year or so? When did you know that [insert something the person has shared about their attitudes or feelings]? Have you learned any good lessons lately? When have you really changed your mind about something? At your next business social gathering, arm yourself with a few of these types of questions and try them out. Learn to segue into them rather than just bluntly asking them as you meet people. You don’t want to come across as a psycho. It’s a conversation – there should be back-and-forth. It’s also important that you have your own stories around these questions, at least partly because if someone can’t think of a response, they will ask the same question of you. So see what stories you can encourage people to share. This will help you become a wonderful conversationalist. I was reading rather casually until #5: How close have you come to death? Now that is a question. I immediately thought of three incidents involving my life, two having to do with my stupidity and cars, in that order and the third, flying, as in taking flying lessons in a single engine plane. I spent a good 15 minutes revisiting those incidents which I still remember with vivid details. I can’t wait to try this out in a networking event and see what reaction I get. Hopefully it won’t be creepy-weird but will elicit a really good story. Let me now how you go Murray. All the best. what would your today self tell your younger self starting out on this journey? It’s a good question Victoria but do you think you would get a story? I think you would get a set of principles or things to watch out for. What’s your experience of this question in eliciting stories?